The museum operates from two sites within London. The main site in Covent Garden uses the name of its parent institution, sometimes suffixed by Covent Garden, and is open to the public every day, having recently reopened following a two year refurbishment. The other site, located in Acton, is known as the London Transport Museum Depot and is principally a storage site that is open on regular visitor days throughout the year. 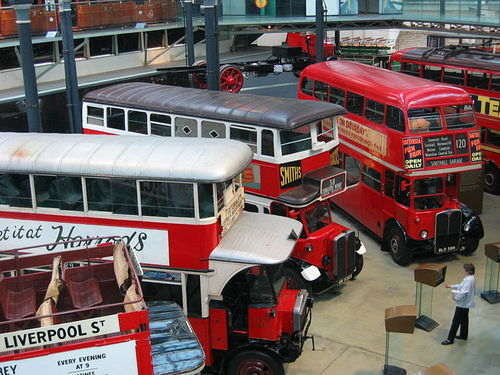 The museum was briefly re-named London's Transport Museum to reflect its coverage of topics beyond London Transport, but it reverted to its previous name in 2007 to coincide with the reopening of the Covent Garden site. What are the Opening Times of London transport Museum ? Music player - The Beatles - "Yestersay"
For further information, see our Access and facilities page. Take the heat off your feet in The Upper Deck café and bar. The stylish interior features seating upholstered in a unique 'moquette' fabric design based on the pattern used on the Northern line in the 1930s. Enjoy morning coffee, lunch and afternoon tea and perhaps a cocktail to end the day. In addition to The Upper Deck, the Museum also has a small picnic area where visitors can eat their packed lunches.